In 1971, Bruce Iglauer founded Alligator Records, an independent record company which, in the decades since, has proven to be the most successful modern blues label. In early 1992, Iglauer staged the Alligator Records 20th Anniversary Tour starring Koko Taylor and her Blues Machine, Elvin Bishop, Katie Webster, the Lonnie Brooks Blues Band (featuring Lonnie's son Ronnie Baker Brooks), and Lil' Ed and the Blues Imperials. Director Robert Mugge, having recently made the film DEEP BLUES (1991) about the blues traditions of Mississippi, decided to follow up with a tribute to Alligator and its roster of top contemporary blues artists from Chicago and elsewhere. 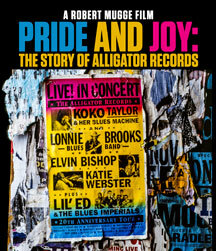 The resulting film, PRIDE AND JOY: THE STORY OF ALLIGATOR RECORDS, presents musical highlights from one of the 4-plus-hour concerts (March 12th at Philadelphia's Chestnut Cabaret) that made up the tour, glimpses of Alligator's Chicago offices, and profiles of key performers and staff members. The "pride and joy" on display are not only that of fine musical artists plying their trades, but also that of a passionate and highly principled entrepreneur succeeding in a business mostly controlled by corporate giants and littered with the wreckage of countless small, independent labels. Songs in the film include "Pride and Joy" and "Ed's Boogie" (Lil' Ed), "Pussycat Moan" and "Lord, I Wonder" (Katie Webster), "El-Bo" and "Beer Drinking Woman" (Elvin Bishop), "I'd Rather Go Blind" (Koko Taylor), "Wife For Tonight" and "I Want All My Money Back" (Lonnie Brooks), "It's A Dirty Job" (Koko Taylor with Lonnie Brooks), and "Sweet Home Chicago" (final joint encore). A companion soundtrack-and-tour CD set is available from Alligator Records. Transferred to HD from the original 16mm film and lovingly restored. The first time on DVD for this classic blues film. 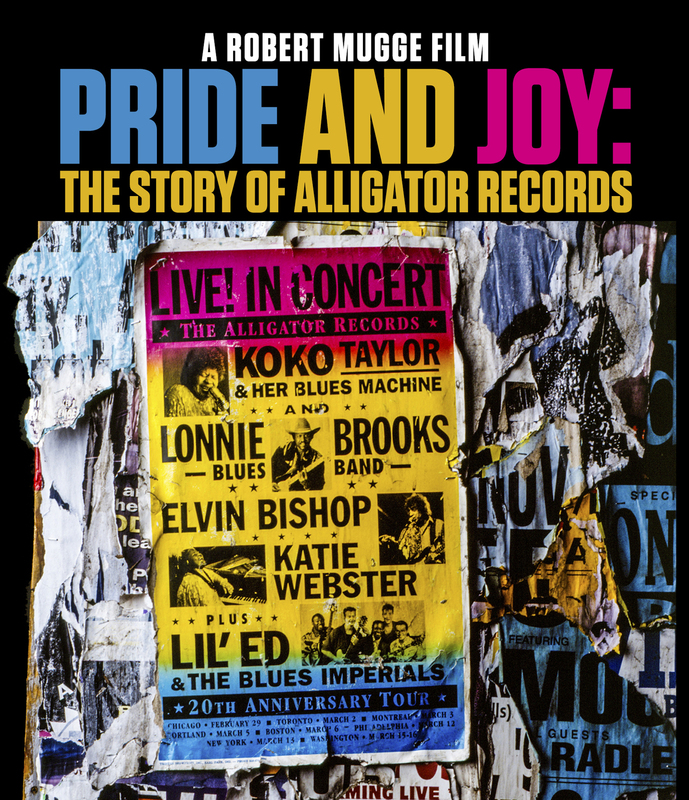 Fans of blues who wailed along with director Robert Mugge's incisive documentary DEEP BLUES in 1991 have a new blues treat to bite into with PRIDE AND JOY: THE STORY OF ALLIGATOR RECORDS...certain to have viewers dancing in the aisles. The stars of Alligator Records put on as intense a show as you are likely to attend. The filmmaker is the exceptional Robert Mugge, who knows better than anyone alive how to show musicians at their best. Straightforward and infectious [with] recording artists...seen in exuberant performances. Iglauer...comes across as savvy and dedicated. Inspiring live performances...tear up stage and screen with wailing blues and true soul. PRIDE AND JOY is a tribute to Iglauer's blue velvet valentine. [It] will put a tingle down your spine. People cheered and applauded as if they were at a live concert. I've never seen that happen before at a movie. For blues freaks, it's must see, must hear. A fascinating look at the pivotal Chicago blues label. Koko Taylor and her Blues Machine, the Lonnie Brooks Blues Band, Elvin Bishop, Katie Webster, and Lil' Ed and the Blues Imperials are uniformly dynamite. As fascinating and inspiring a primer for would-be label entrepreneurs as it is a concert souvenir for blues enthusiasts. Iglauer may be the most likable executive in the record biz. The story is an inspired one. PRIDE AND JOY, all spirit and insight, sits somewhere in the vicinity of the great music documentaries of the late '60s and early '70s. White-hot musical numbers demonstrate the versatility of Iglauer's house performers as they kindle fervent response. The sound quality is outstanding, and the camerawork brings viewers into immediate contact with the performers.